MITZPE RAMON, ISRAEL–The second visit of the day for Wooster’s Team Israel 2013 was to the Gevanim Valley on the south side of the Makhtesh Ramon structure. 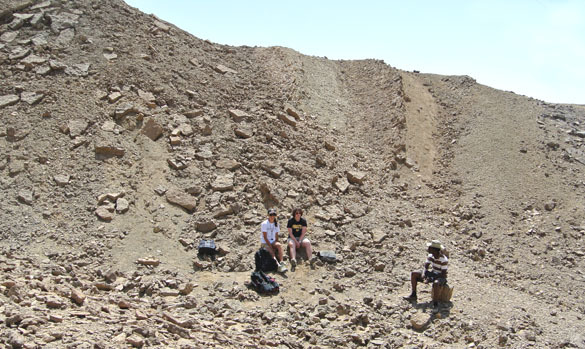 This is a fascinating place where Cretaceous intrusions formed an uplifted dome exposing Triassic sedimentary rocks. 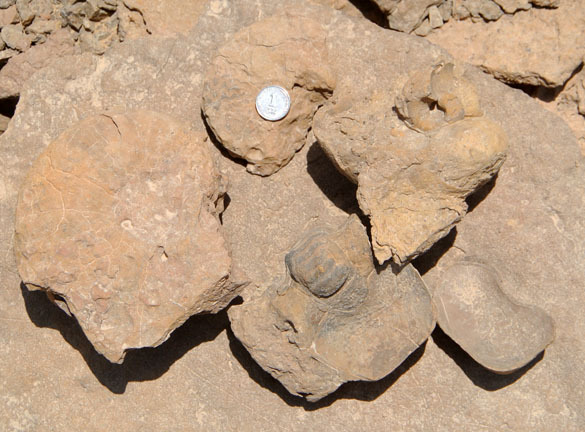 It is a rare place to see abundant Triassic marine fossils. Our first stop was a nordmarkite stock intruded into the Gevanim Formation (Middle Triassic, Anisian). We always dedicate this image to our own Dr. Meagen Pollock who knows what nordmarkite is without having to google it. 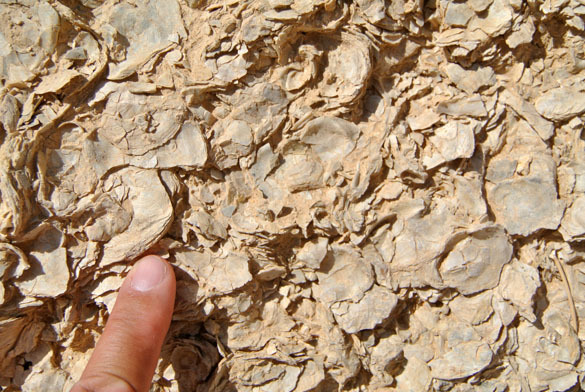 Our first task was to locate the Gevanim Formation and examine the many specimens of the large bivalve Ramonalina ramanensis to look for rare Triassic encrusters. Above is an outcrop of the part of the Gevanim which has large numbers of this dark-colored, shoe-shaped clam. Here are two nearly complete specimens of Ramonalina ramanensis. Alas, we found not a single encruster. The rumor that there are microconchids on these shells seems to be false. Science marches on. 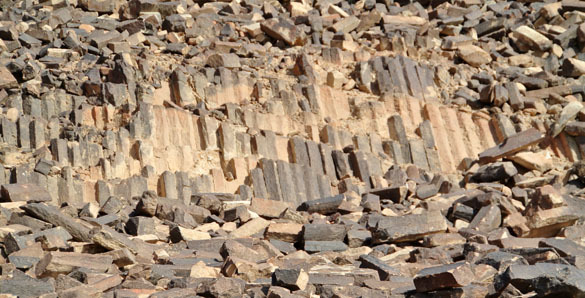 Above the Gevanim Formation is the Saharonim Formation (Middle Triassic, Anisian-Ladinian). 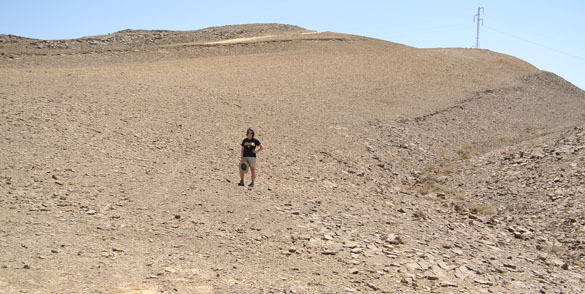 Lizzie Reinthal is here standing near the base of it exposed in the western part of the Gevanim Valley. This is a very fossiliferous limestone and marl that is extremely well exposed here. Nautiloids and ammonoids are very abundant in the Saharonim. In fact, just about every large object in this exposure of the unit is one or the other. The coin in the image above is sitting on an ammonoid (a ceratite). 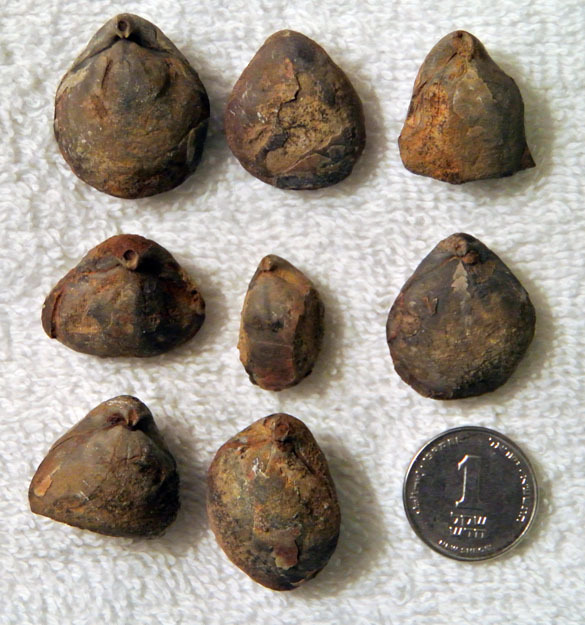 The other fossils are internal molds of nautiloids. Our goal today, though, was to find terebratulid bachiopods with original calcite still preserved. We found dozens, a few of which are shown above. These are mostly of the genus Coenothyris. These specimens are destined for isotopic analysis in the laboratory of Dr. Pedro Marenco at Bryn Mawr College. Mission accomplished. MITZPE RAMON, ISRAEL–At first glance this rocky outcrop in the middle of Makhtesh Ramon appears to be a typical columnar-jointed basalt. We’ve seen this many times on our blog (for example here and here). 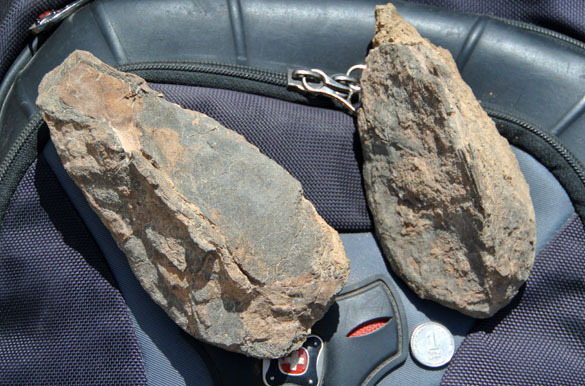 However, these rocks are entirely a quartzose sandstone. 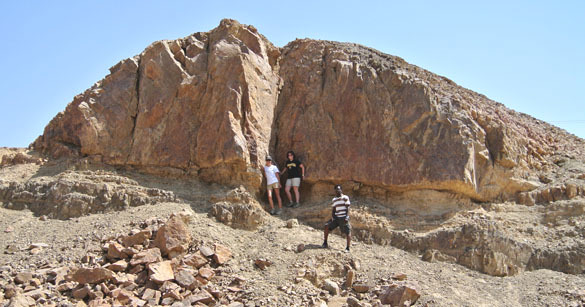 They have the typical polygonal joints of a cooled lava flow, but the rock is an unmetamorphosed sedimentary unit. This remarkable site is known as “the carpentry” (Haminsara) in the park. How did these joints form? It is not from the sandstone melting and then cooling, like you’ll see in some places on Wikipedia. (And some people think this is basalt, which is a good reason for more interpretive signs in this place.) Likely it was a hydrothermal process by which superheated water from nearby intrusions warmed up the sandstone until it expanded a bit, and then it cracked along these joints during cooling. The sandstone was never heated to temperatures that would turn it into quartzite, much less liquid. Columnar-jointed sandstone is rare but not unique, as you can see here and here. 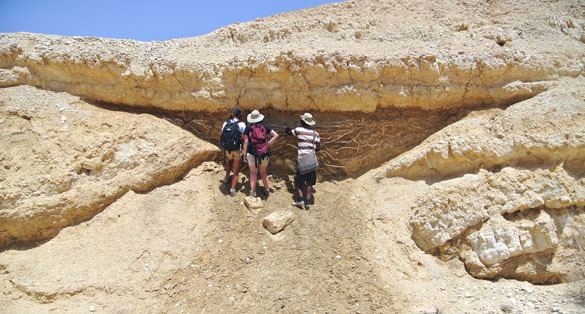 This was the first stop for the Wooster Geologists in Israel today as we explored parts of Makhtesh Ramon to follow up on various small projects.